Brand new and used Tractors for Sale and Auction. The history of the tractor begins with the first powered farm implements in the early 1800s which were portable engines steam engines on wheels that could be used to drive mechanical farm machinery by way of a flexible belt. Around 1850, the first traction engines were developed from these, and were widely adopted for agricultural use. Where soil conditions permitted, like the US, steam tractors were used to direct-haul ploughs, but in the UK and elsewhere, ploughing engines were used for cable-hauled ploughing instead. Steam-powered agricultural engines remained in use well into the 20th century, until reliable internal combustion engines had been developed. In 1892, John Froelich built the first practical gasoline-powered tractor in Clayton County, Iowa. Only two were sold, and it was not until 1911, when the Twin City Traction Engine Company developed the design, that it became successful. In Britain, the first recorded tractor sale was the oil-burning Hornsby-Ackroyd Patent Safety Oil Traction engine, in 1897. However, the first commercially successful design was Dan Albone's three-wheel Ivel tractor of 1902. In 1908, the Saunderson Tractor and Implement Co. of Bedford introduced a four-wheel design, and went on to become the largest tractor manufacturer outside the USA at that time. A 1920 International Harvester tractor, showing features inherited from earlier steam tractor designs. While unpopular at first, these gasoline-powered machines began to catch on in the 1910s when they became smaller and more affordable. Henry Ford introduced the Fordson, the first mass-produced tractor in 1917. They were built in the U.S., Ireland, England and Russia and by 1923, Fordson had 77% of the U.S. market. The Fordson dispensed with a frame, using the strength of the engine block to hold the machine together. 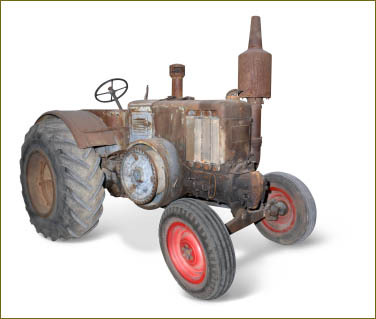 By the 1920s, tractors with a gasoline-powered internal combustion engine had become the norm. The classic farm tractor is a simple open vehicle, with two very large driving wheels on an axle below and slightly behind a single seat (the seat and steering wheel consequently are in the center), and the engine in front of the driver, with two steerable wheels below the engine compartment. This basic design has remained unchanged for a number of years, but enclosed cabs are fitted on almost all modern models, for reasons of operator safety and comfort. Originally, plows and other equipment were connected via a drawbar, or a proprietary connecting system; prior to Harry Ferguson patenting the three-point hitch. Recently, Bobcat's patent on its front loader connection has expired; and compact tractors are now being outfitted with quick-connect attachments for their front-end loaders. Larger types of modern farm tractors include articulated four wheel or eight wheel drive units with one or two power units which are hinged in the middle and steered by hydraulic clutches or pumps. In the early 21st century, articulated or non-articulated, steerable multi-track "tractors" have largely supplanted the two-track clutch-steered "Caterpiller" type for farm use. These tractors bear little resemblance to the classic farm tractor design. A variety of specialty farm tractors have been developed for particular uses. These include "row crop" tractors with adjustable tread width to allow the tractor to pass down rows of corn, tomatos or other crops without crushing the plants, "wheatland" or "standard" tractors with non-adjustable fixed wheels and a lower center of gravity for plowing and other heavy field work for broadcast crops, and "high crop" tractors with adjustable tread and increased ground clearance, often used in the cultivation of cotton and other high-growing row crop plant operations, and "utility tractors", typically smaller tractors with a low center of gravity and short turning radius, used for general purposes around the farmstead.